Ready for pick-up? There are three convenient ways to reach us! “One-Touch” pick-up: Launch the MVP mobile app and hit “One-Touch” pick-up. 2. How much time should I allow for check-in and transportation to the airport? 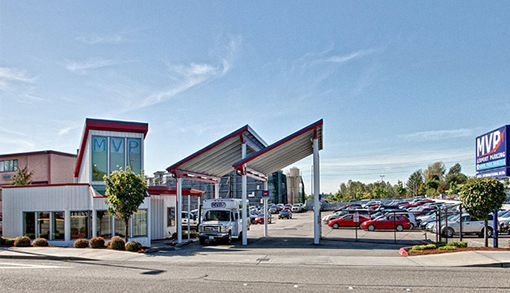 Our facility is located less than one mile from Seattle-Tacoma International Airport. We suggest you allow fifteen minutes for MVP check-in and transportation to the airport. 3. Where are the MVP eco-shuttle airport drop-off and pick-up locations? MVP will deliver and pick you up on the third floor of the parking garage at ground transportation islands 1 and 3. 4. Is your parking facility safe and secure? Your safety is our top priority! MVP is equipped with bright lights, cameras and a well-trained team as well as a comfortable office lounge for you to enjoy. 5. Does MVP accept oversize vehicles? Yes, but with some limitations, please call MVP at 206-243-3211 to verify space, availability and pricing. 6. Can I park my car and keep my keys? In order to provide the best service to all of our customers we valet park all cars and safely store your keys. We prefer that you leave only the ignition key and remote necessary to operate your vehicle. 1. How are days calculated? We charge per 24-hour day. 2. Do you charge partial days? Yes, partial days are charged at $2.50 per hour until the daily rate is reached. 3. Should we make a reservation? installing the MVP “on the fly” mobile app or by logging in to your account. 4. What is your refund/cancellation policy? Reservations must be cancelled or rescheduled 48 hours prior to the day of the reservation. Prepaid reservations are refundable until 48 hours prior to the day of your reservation. Cancellations within 48 hours of the day of your reservation are non-refundable. 1. How do I enroll in the MVP Rewards Program? Click here to create an account, log-in, park and earn! You can also download the iPhone or Android app, log-in and begin earning points today! 2. How do I earn MVP Reward points? Earn up to three points per paid parking day. Partial days not included. 3. What can I do with my MVP Reward points? Points can be used for FREE MVP Parking, FREE Hand wash Car-Washes and FREE Alaska Airlines Mileage Plan® Miles. 4. How many points do I need for a reward? 5. How do I redeem my points? Points can be redeemed online, through the mobile app or you can tell your MVP Team Member. A reward balance will be available on your MVP account page and on each receipt.